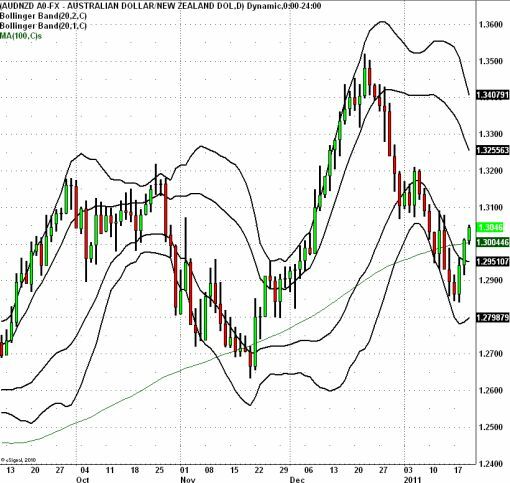 Approximately 2.5 weeks ago, I posted a chart showing how a turn is in the making in AUD/NZD. At the time,the currency pair was trading at 1.3050. It dipped afterwards but has finally achieved the turn that I was looking for -- which is a move to the opposite second standard deviation Bollinger Band. 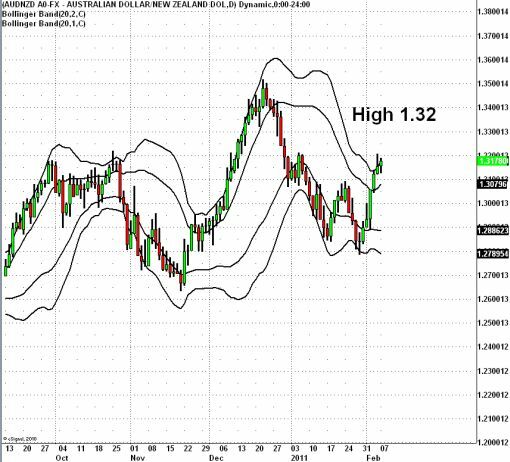 Typically a move into the 1-2 Upper BB Zone suggests that more gains are likely but 1.32 is a fairly significant resistance level for the currency pair. If it fails to break above that level, there is a strong possibility that it will form the “right shoulder” of the head and shoulders pattern. However if manages to clear that level, then it could be clear sailing up to 1.35. This week we have the Australian employment report which will be central in determining how this setup plays out.